April 16-22 is Severe Weather Awareness Week in Colorado. We will be brining you a series of tips each day so you can be prepared for the weather ahead. Thursday's article is available here. NOAA All Hazards Weather Radio is another great way to monitor the weather and receive warnings. KiowaCountyPress.net and Plains Network Services in Eads will be giving away three weather radios at the end of the month - just stop by 1208 Maine Street in Eads to register to win. Thunderstorms produce some of the most dangerous weather on Earth, Including tornadoes, flash floods, large hail, and destructive straight-line winds. However, the most dangerous aspect of thunderstorms in Colorado is usually lightning. Lightning usually kills and injures more people in Colorado than any other thunderstorm hazard. In 2016 there were two documented fatalities and six lightning strike survivors in Colorado. In addition to producing human casualties, lightning also ignites most forest and rangeland fires in the Centennial State. 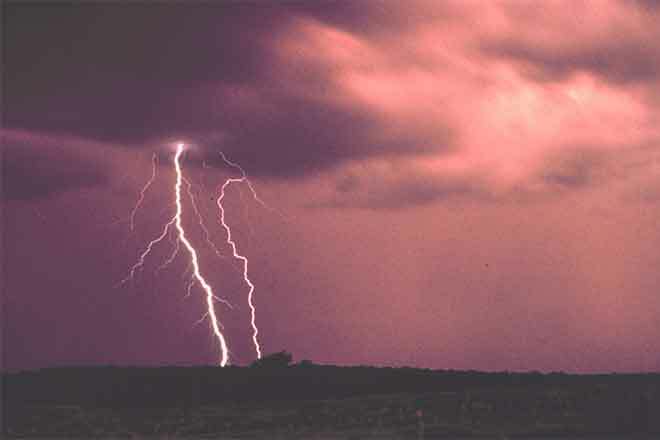 Many of these wildfires occur when lightning is generated from thunderstorms which produce little or no rainfall. This type of lightning is commonly referred to as dry lightning. The safest thing for you to do if you are outside and lightning or thunder begins to occur is to immediately get inside a substantial fully-enclosed building, such as a house, a store or a church. Metal-topped vehicles also offer excellent protection from lightning. Once inside a substantial building or metal-topped vehicle, keep all windows and doors closed, and do not touch any metal inside the vehicle. It is then recommended that you wait at least 30 minutes from the last rumble of thunder before returning outside. A recent lightning safety study has shown that 95 percent of the people who were struck by lightning while outdoors had a nearby substantial building or vehicle nearby. Remember, there is no safe place outdoors when lightning is occurring. Do not seek shelter under picnic shelters, sports dugouts, porches, trees, carports or tents. These types of structures are not safe when lightning is occurring. Once inside a substantial building, stay off corded telephones and away from electrical appliances since the electrical discharge can travel along the telephone lines and electrical wires to produce fatal results. Stay away from water, including showers, tubs and sinks. Even indoor swimming pools are not safe when lightning is occurring. It is also recommended that you unplug sensitive electronics such as computers when lightning is expected to occur nearby. The best defense to protect yourself against a lightning strike is to plan ahead and avoid being caught where you might be vulnerable. Check the weather forecasts prior to venturing out, especially if you are heading into the mountains. Plan your outdoor activities for early in the day before thunderstorms typically develop. Stay tuned to NOAA All Hazards Weather Radio and check the National Weather Service forecasts at http://www.weather.gov. It is very important that all sports leagues and other outdoor groups have a lightning response plan that is understood and consistently applied for the safety of the participants. Part of the plan would include a designated weather watcher at each outdoor event with the authority to postpone or cancel the event due to the threat of lightning. Remember, if thunderstorms threaten, seek shelter in a substantial building or in an enclosed metal roof vehicle. Stop by 1208 Maine Street in Eads to register to win one of three weather radios being given away by KiowaCountyPress.net and Plains Network Services. Entries close at 4:00 p.m. Friday, April 28, 2017. Weekend Weather Outlook: Sunny, Snow Sunday?